Aspiration blinds in Bolton like to work with a range of companies and sectors. Restaurants being one of them. Restaurants in the UK have it tough. 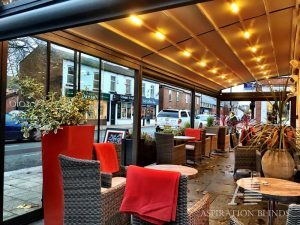 We’ve seen so many instances where a restaurant has outdoor space but is only able to make use of it when the weather says it’s okay to do so. There aren’t many business models that let the weather impact on how well they work! If you have a restaurant with an outdoor area are you getting the most out of it? If you’re only using it for a small portion of the year, yet are paying for the privilege all year round, your profitability will be limited. We had one such client approach us who have an amazing outdoor section. They pay for this extra square footage and wanted to be able to share it with their customers all year round. It’s an open-air space; it’s always been great in the Summer when the sun’s shining. Sadly, it became unusable for them when the temperature was low, the wind was up, or the rain was pouring. Which Ideas Didn’t Make The Grade? The main design challenge was to come up with a practical solution for all weathers that managed to still feel outdoors. The restaurant already has a great indoor area. The owners were keen to be able to make use of the outside space to offer their customers something a bit different. There were a few initial suggestions floated around that we didn’t think were quite right. For example, a lean-to awning. In principle the idea was okay, however we quickly identified some concerns. Would it look a bit ‘thrown together’ against the glamour of the main restaurant building? How would it cope in windy and rainy conditions? We had to come up with something better; a more stylish and practical proposal. To deliver an outdoor area that could be used at any time of day and in a variety of different weather conditions, we had to design and implement something special. 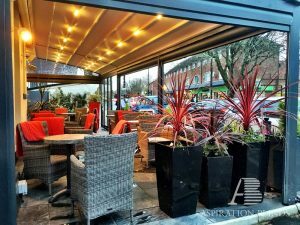 We agreed with the restaurant that the best way forward was to utilise a sturdy structure that could still embrace the full outside experience for their customers. We introduced a retractable roof that also featured lights. This can be fully opened when the weather’s good or completely closed when needed. The addition of lighting means it can be used well into the evenings too. We also added a glass, sliding, entrance, along with rising glass balustrade screens. This fitted the bill perfectly in terms of allowing the full outdoor experience. It also ensured the elements could be easily shut out if the weather turned problematic. We’re delighted that our client now has an extra 20 dining covers and a further 10 drinking/casual dining covers outside. They’re now able to make full use of their outdoor space. Being able to use it all year round will add to their bottom line and they can even take bookings for this area at Christmas! A massive thank you to aspiration blinds andChris Byrne. Absolutely love my new blinds. Just finished my kitchen off. Service with a smile and so professional and not expensive AT ALL . Will be recommending to all my friends ??? Sharples run a busy office and showroom in Cheshire and so the presentation and feel of our building has got to be right. The Aspiration Blinds team listened to what we wanted and came back with an affordable but stunning window system. A great service from a brilliant, considerate and excellent value family business. Would recommend to anyone! Fantastic service from start to finish. Great choice of fabrics and products and at reasonable cost. I have only one room left that needs an Aspiration Blind makeover. Highly recommend. Great service and a good choice of quality blinds. I now have blinds from Chris in four rooms of my house and I love them! I have used Aspiration Blinds on more than one occasion and I have found that from the time you ring the enquiry telephone number to when the blinds are installed the friendliness and overall customer experience to be second to none. Arrange a free no obligation design consultation at your home or place of work.